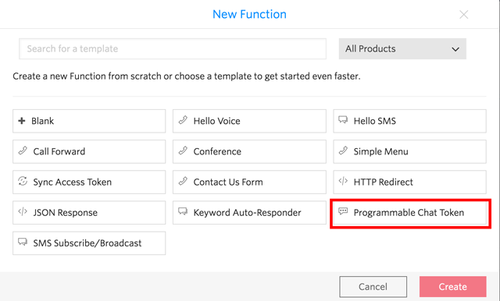 In this guide, we will get you up and running quickly with a sample application you can build on as you learn more about Programmable Chat. Sound like a plan? Then let's get cracking! Mobile Push Credential SID Used to send notifications from Chat to your app - create one in the console here or learn more about Chat Push Notifications in iOS. When you build your application with Twilio Chat, you will need two pieces - the client (this iOS app) and a server that returns access tokens. If you don't want to set up your own server, you can use Twilio Functions to easily create this part of your solution. 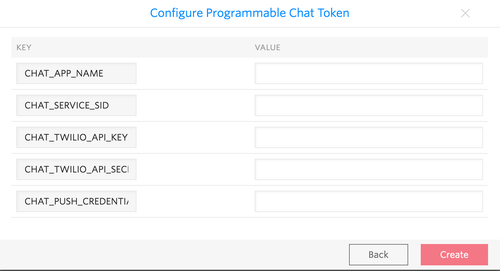 Select the Programmable Chat Token template and click Create on the above dialog box, and then fill in the account information you gathered above on the next screen. After you do that, the Function will appear, and you can read through it. Save it, and it will immediately be published at the URL provided - go ahead and put that URL into a web browser, and you should see a token being returned from your Function. If you are getting an error, check to make sure that all of your account information is properly defined. Now that the Twilio Function is set up, let's get the starter iOS app up and running. You will need to go into ViewController.m or ChatViewController.swift and modify the URL for your Twilio Function there - each Twilio user will have a different domain to use for their Twilio Functions. Start sending yourself a few messages - they should start appearing in a UITableView in the starter app. You're all set! From here, you can start building your own application. For guidance on integrating the iOS SDK into your existing project, head over to our install guide. If you'd like to learn more about how Programmable Chat works, you might want to dive into our user identity guide, which talks about the relationship between the mobile app and the server.